Sankalp Programme Activities, Competitions for Schools - 70 years of Independence Day Celebrations 2017/ Sankalp Programme Activities, Quiz, Painting Competitions for Schools - 70 years of Independence Day, Sankalp Programme Schedule under 70 years of Independence Day on 15th August, 2017, Sankalp Programme implementation guidelines: This year, the nation is completing 70 years of independence on 15th August 2017. Also, this is the year when 75 years ago, the· Quit India movement was launched on 9th August, 1942. It is desirable that this momentous occasion should .be celebrated with an objective to create a festive and patriotic mood across the nation and a movement is created to involve every citizen of this country in the mission of realizing the vision of a New India, which is clean (Swachh) and free from poverty, corruption, terrorism, communalism and casteism. Sub: TSSA Hyderabad - 70 years of Independence Day on 15th August, 2017 - Sankalp Programme from 9th to 30th August, 2017 - Celebrations - Certain Instructions - Issued - Reg. Ref: Govt.Memo.No.5672/SE.Genl./Al/2017, SE (Genl.) Dept.,Dt. 09.08.2017. Copy of the Government Memo in the reference cited along with its enclosures are herewith communicated to all the District Educational Officers & EO-DPOs of SSA in the State. In this context, they are requested to implement the Programme and issue necessary instructions to the MEOs/HMs/Model School Principals/Special Officers of KGBVs for implementation in the Schools as per the guidelines and furnish Photographs/Video Clippings of the events conducted on this occasion. Encl:- (As above). Sub: School Education - 70 years of Independence Day on 15th August, 2017 - Sankalp Programme from 9th to 30th August -2017. D.O.Lr.No.15-3/2017: As you are aware, this year, the nation is completing 70 years of independence on 15th August 2017. Also, this is the year when 75 years ago, the· Quit India movement was launched on 9th August, 1942. It is desirable that this momentous occasion should .be celebrated with an objective to create a festive and patriotic mood across the nation and a movement is created to involve every citizen of this country in the mission of realizing the vision of a New India, which is clean (Swachh) and free from poverty, corruption, terrorism, communalism and casteism. • Arrange a Sankalp programme: Every school should arrange a Sankalp programme from 9th August. to 30th August 2017. This programme may be arranged in the premises of a nearby Shaheed Smarak, commemorating the martyrs of Independence movement or various wars/terrorist actions since then. In case, there is no such landmark in the vicinity of the· school, the programme may be organized in the school itself. In this programme, an oath is to be administered to all the teachers and students to make the country clean (Swachh} and rid the country of the five problems of poverty, corruption, terrorism, communalism and casteism in the next 5 years i.e. when the nation completes 75 years of its independence in 2022. A copy of the oath is enclosed herewith. A photograph of the martyrs/freedom fighters from the locality or district may also be installed in the schools on this occasion. This is to be followed by a speech by any teacher or any other guest and student on the oath and how we all can together strive to achieve our resolve and rid the country of these vices. • Quiz competition: A Quiz competition on the Independence struggle and India's development will be launched on the MyGov website and will be accessible through https://quiz.mygov.in on the 9th August, 2017 and will be available till 15th August, 2017. It will also be available on Narendra Modi· App which can be downloaded on any srnartphone. All students of classes Xl and XII may be encouraged to take this quiz on an online mode. For participation, each student has to first register with MyGov (if not already registered) and get credentials or can log in using Facebook/Gmail credentials/fresh credentials on the Narendra Modi App. This quiz may also be printed put in a physical form and given to the students. The same may be evaluated at the school level and the students who score the highest may ·be suitably felicitated. • Painting competition: A painting competition may be organised for children of classes VI to X on the theme of independence movement from the 9th to 30th August, 2017. The best paintings out of these may be displayed in the school notice board/published in school magazine and also uploaded on school websites etc and the children may be suitably felicitated. 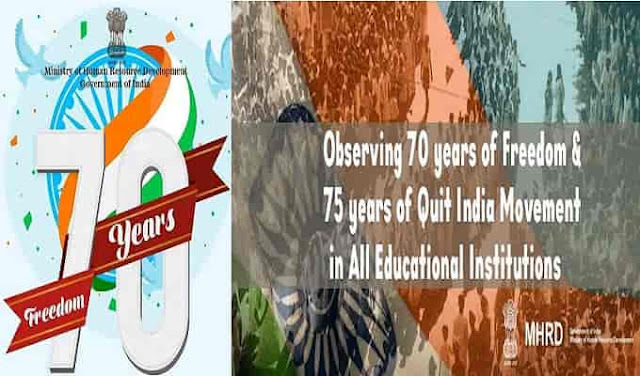 In order to create a mass favor in favor of this national mission, it is requested that due publicity may be given to all these events over the local print and electronic media, social media, websites of schools/education department and also uploaded on the Shagun platform of Department of School Education and Literacy, MHRD and Facebook page of Ministry of Human Resource Development i.e. https:/www.facebook.com/freedom70yearsmhrd/ after logging in from your account.